Are you a good Deus Ex Machina, or a bad Deus Ex Machina? Who, me? Well, that’s a pun, you see. Gaaugh, aren’t I charming? There are three compelling reasons to read this post. You don’t know what Doctor Who is and you want to get familiar enough with the show to make the cute nerdy objects of your affection thank the world for your existence. You want to read about plotting, plausibility and writing yourself out of corners, and you love charts. God personally descended into your coffee shop / library or home office by means of a winch and pulley system and ordered you to do so. This is where I’d encourage you to read on using a Dr. Who catchphrase, but, please love, if you’d just click on, just click that “Read More” button right there, NO NOT THAT ONE! Yesss, right there!! And I’m really suggesting you do it right now if you wouldn’t mind. You’ll spare us all some very slight, slight, inconvenience. Hm? Oh, just the destruction of all existence. Now, click it. Please. Greetings from the land of 10,000 lakes, more specifically Latitude 45 6’53”, Longitude -93 30′ 4″ (at least that’s what Google Maps says is my Latitude and Longitude). I recently started watching the current version of Doctor who and I have a few things I would like you to overthink. As a fairly new fan to Doctor Who it seems that the writers on the show rely heavily on some version of a deus ex machina in every episode to get the heroes out of trouble. Whether it be the all powerful sonic screwdriver or some sci-fi/technobabble that the Doctor remembers at just the right time. At one point during my viewing I thought that perhaps this is just a running joke of the show and it is something to be embraced, what are your thoughts? Is the use of the deus ex machina in popular culture always a crutch for lazy writing, or do appropriate situations exist in which the use of a deus ex machina is called for? (Last name withheld in case in a first date of his googlestalks him in three years. You can thank us later. I am Zeus, and I command that the nerds get to date the cheerleaders, and the jocks have to go to summer school! Overthinking It readers are savvy, intelligent folks with discerning tastes – they are, without exception, tremendously personally and physically attractive, possessed of personal dynamism, professionally and academically successful and great fun at parties. If you weren’t all these things when you first read Overthinking It, first of all, you probably were and it’s just a confidence problem, and second, don’t worry, every page you load will imbue you more deeply with these desirable personal qualities. But even with all that wonderful stuff, it’s only fair to give you some idea of what I’m talking about before I start going on a series of ridiculous tangents, as is my wont. Deus Ex Machina — Literally “God From the Machine,” this refers to the ancient theatrical tradition of bringing God, a god or gods onstage at the end of a play to set up the ending, usually by rewarding good people for being good and punishing bad people for being bad. This is traditionally accomplished by something appropriately reverent, like pushing him up through a trap door in the floorboards, lowering him from above the stage with a rope tied around his waist, or wheeling him in on some sort of cart. 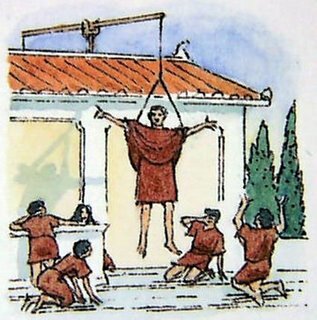 The Greeks usually used a crane. In a contemporary stage production, the “Machina” in “Ex Machina” would probably involve a smoke machine or a light show. (By the way, having to evacuate your audience because your smoke machine set off the fire alarms in the theatre is not something you want to do. I’ve been in the audience for that once; it was silly). Over the years, the term has expanded to refer to any time when something or somebody who has not been a major part of the story so far shows up at the end of a play, movie or TV show more or less at random to dictate how it ends, usually making everything the characters have done up until this point seem irrelevant by comparison. I’ll take swords for 200, Trebek! Take Robin Hood, for example. Robin Hood goes around robbing people, poaching deer, and violating all sorts of zoning ordinances by building his little city in the woods. He eventually gets caught and sentenced to death, so he and his followers stage an escape, find the head magistrate of a major English city, kidnap his fiancé and murder him (by swashbuckling, a.k.a. stabbing). At the end of the story, you’d think Robin Hood maybe gets away for a while and is basically a homeless gangster until one of the Merry Men gets pinched for illegal dueling and snitches or his little shantytown gets wiped out by typhoid fever, but no — King Richard comes back from the Crusades! All is forgiven! Robin even gets back his father’s lands and gets to marry his high school sweetheart. That’s a Deus Ex Machina. When King Triton gives Ariel legs at the end of The Little Mermaid, that’s not a Deus Ex Machina. King Triton has been a major character in the story so far, we’ve established that his trident has magical transformative powers, and we’ve already seen the various sorcerers and mystical beings of the ocean have the power to do this specific thing — make homo sapiens sapiens out of homo sapiens seashell-bra. 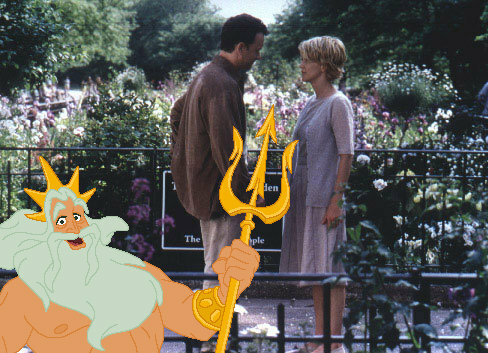 If King Triton showed up at the end of You’ve Got Mail and sent Meg Ryan and Tom Hanks to a magical island where independent bookstores were commercially viable, that would be a Deus Ex Machina. The Architect at the end of The Matrix Reloaded is a hit-you-over-the-head-with-stupid literal Deus Ex Machina. See, he’s a god, and he’s in the machine. And he explains to you how everything works and makes most of the plotline up until this point irrelevant. Then he makes a bunch of mysterious judgements. But I don’t want to talk about him anymore. There’s little nuance to it, and it’s depressing. Don’t look directly at him! Go to the next page! The next page!!! As a Brit, I like your notion of The Doctor as idealised national metaphor. Is there an equivalant American figure on your screens at the moment? I’d love to see that graph applied to Star Trek series. TOS seemed to have way more deus ex machina endings than I felt comfortable with. Great article, though you did forget to mention that one of the great appeals of the show are the hilariously bad special effects. @wrather: Jack Bauer as avatar of America? Maybe of post-9/11 America (though I would say we are now probably entering the post-post-9/11 era). The frontier has so long been a part of American mythology that some explorer should really get the part. Captain Kirk is the obvious choice, though that seems unsatisfying, precisely because it is such an obvious choice. Though probably in truth any character will only embody some aspects of the national spirit (The Doctor doesn’t sum up everything to do with the UK either). Thanks for taking the time to write a great article on my question of the deus ex machina in pop culture. In true overthinking it form you managed to ascribe way more meaning and insight to my question then I ever dreamed. P.S., the land of 10,000 lakes is indeed Minnesota. @Wrather Jack Bauer was my original thought as well, but i think he is more Bush-Era than anything else. Perhaps Captain Mal Reynolds? Fantastic post, but what happened to the diabetic and flu afflicted loved ones?!? Jack Bauer is symbolic, but he’s not metaphorical enough. He does dissociate himself far enough from the familiar to make the sort of intellectual points that the Doctor makes. Now, The Doctor and Jack Bauer are very similar as archetypes, but the metaphor I was talking about came from the relationship between The Doctor and his Companions, which is much more interesting and, I think, uniquely characteristic of the show. Jack Bauer doesn’t have anything comparable to that. Superheroes are so proliferate and kicked at this point that I really hesitate to pick any of them. Batman and Superman aren’t more interesting than other superheroes to nearly the extent The Doctor is more interesting than his fictional peers. Then again, very few characters have been around as long as The Doctor and come to carry so much cultural weight. Buffy the Vampire Slayer would be a good candidate if she were still on TV. I’ve always thought Robocop and Blade were great picks for the quintessentially American representative fantasy character, but they aren’t on TV now either. If I watched Lost, maybe the answer would jump out at me from there, but that doesn’t seem to be the kind of show that makes answers jump out at anybody. I also don’t watch Gossip Girl, in case the answer is in there. If you think of Oprah as a fictional character (which isn’t really that far off the mark), she’s pretty close. Who captures the American simultaneous obsession and revulsion with authority? Who shows off its pathological self-aware inability to lose faith in itself? Who runs the show on the fringe of the wilderness, on the edge of civilization? Who, through his relationships, speaks to the madness and beauty of Federalism? Who throws open the doors to all the people who end up on his doorstep, until the exact moment when he become disenchanted with them and starts throwing them out and accusing them of stealing things? Who loves being big-time, but secretly wishes he could be smaller, and really wishes the world could be smaller and cause him fewer problems? And how do I post an image in a comment thread like Wrather did? @ mlawski — On it. It might take a while. @ Max — Yeah, I only addressed it in an image caption — “There are silly aliens and lighting effects. Lovely.” But the visual style of the show is very endearing, even when it is awful. I’ve written on it before, but maybe at some point I’ll do a formal post about how much I hate what I call “Head Vampire Theory” – which is what I’m illustrating in those plot charts. Part of it is that once your central problem is solved, all your other problems are either immediately solved or don’t matter – and that’s just silly. But it gets worse . . .
Grrr. Maybe I am not allowed to hotlink. And by the way, I know The Office is an original show, and I’d argue the American version only found its legs when it dispensed more thoroughly with its Britishness – it lost almost all the super-uncomfortable humor, became more shamelessly romantic, and gave Michael this hopefulness that Ricky Gervais never would have put in his character. It would have cheapened Ricky, but for Steve Corel, it works great. @Fenzel: Are you really going to do it? If so, awesome! Actually, my original idea was to track the deus ex machina-ness of ALL the Trek series, to see if they changed over time. My bet is they do. But then I gave up on the idea when I realized how ridiculous it was. However… maybe an analysis of TOS vs. TNG would be doable. 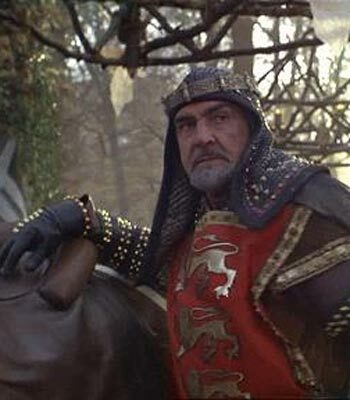 @Fenzel – I believe that Return of the King contains at least two deus ex machina. Obviously, the eagles. But less obvious and more annoying to me is Aragorn’s unstoppable army of the dead. Think about it: Aragorn has the power to command an army of ghosts that effortlessly wipes out Sauron’s entire CGI horde. It is entirely unclear to me why he did not take advantage of this in the first movie. To me, the ghost army is the equivalent of remembering you can call a cab at any time. Another comment: I’ve never seen more than an episode or two of Doctor Who (I know, right?) so I can’t speak to it, but a lot of what you (Fenzel) say about the wacky side of deus ex machina applies handily to Futurama. It seems like in almost every episode some ridiculous technobabble or nonsense technology is used, and it’s always played for laughs. Interestingly, though, the technobabble itself usually ISN’T used to wrap up the episode. Usually the end does stem in some way from what was set up before. It’s just that the logic to get from point A to point B is Futurama logic, which only makes sense from a certain bizarre perspective. Technobabble=>Technobabble breakdown=>Wacky logic based on technobabble=>Back to the status quo! I’d have to do research to make sure, but I’d bet a fair number of Futurama episodes work exactly this way. Would you say Dr. Who works this way, too? @Belinkie: I haven’t read the books in a while, but my understanding is that the journey to revive the ghost army is something of a suicide mission — the characters are pretty sure Aragorn’s not coming back once he heads off to try to find them, so it’s really a tactic of last resort. The movie does somewhat trivialize the peril of this side-trip, and thus, requiring the movie to stand on its own (which I think is fair), it’s a bit of DEM. @Matt: That’s the “6-Pete” to you, Mister. @Mlawski — In Doctor Who, you’re more likely to run into a situation where the technobabble doesn’t even get mentioned until the moment it resolves the plot. They don’t set it up as much. There might be some slight foreshadowing, but it’s pretty rarely related to what caused the problem in the first place. Like, there’s one episode where, at the very end, it’s revealed that one of the characters is carrying a magical amulet that, for an incredibly elaborate reason, one of the other characters is irrevocably bound to. They kill the character (the villain, ‘natch) by throwing the amulet into a lake. Prior to that climactic scene, the necklace was thought to be expensive, but not at all magical, and the main plot was a murder mystery. It’s actually pretty funny – the amateur detectives try to figure out who actually did it, but it turns out that all the clues you have found won’t help you, because The Doctor has a whole mess of information he’s going to give out at the end that nobody else knows and will change everything. @Matt — Yeah, the Ghost Army moment is choice, and I encourage you to write about it. But it’s not purely a deus ex machina, because it doesn’t happen at the end of the story, and it doesn’t resolve any of the major conflicts. It saves Minas Tirith, sure, but only temporarily. It doesn’t save Aragorn from getting bum rushed at the gates of Mordor. We’ve talked about these moments before — you call them “mighty joint” moments, right? “Ghost armies” works just as well. I’d encourage you to write a separate post on their use, types, and acknowledgement. Thank you for the insightful post. I must admit, I don’t care about plot devices when it comes to Dr. Who. Any time the camera is pointed at David Tennant, I have a _Wayne’s World_ moment where the air around him shimmers and _Dreamweaver_ dances gently on the wind. This experience is, of course, delightful, but I do find it a little difficult to follow the plot. P.S. The episode Blink was fantastic, but should really only be viewed during daylight hours, from behind the sofa, with _Murder She Wrote_ on standby, (just in case things get too intense). Isn’t the plural of “Deus Ex Machina” “Dei Ex Machinae?” Of course, I think that implies multiple gods from multiple machines. If you have several gods from the SAME machine, that could be “Dei Ex Machina”. I suppose one god from multiple machines would e “Deus Ex Machinae,” but that’s just silly. I wish I’d seen the older episodes, but with forty years to sift through, I have no idea where to start. Suggestions? Actually, now that I think about it, a true American Archetype would be cinematic, rather than televisual. I’d like to note that several of the technobabble explanations are reused – though sometimes so much later that it’s barely remembered. The worst of these was the Third Doctor’s reversing the polarity of the neutron flow, of course. The Sonic Screwdriver was such a Deus Ex device that they had to create excuses to lose it or break it in the old show, and to circumvent it (“Deadlock seal”) in the new show. Certain forms of the technobabble are worse than others. They have a terrible grasp of the concept of antimatter, but a surprisingly good one of relativity. They make a point of scientific continuity whether it’s good or bad, though: antimatter monsters happen repeatedly, come from a parallel universe, and are specially shielded, but ultimately can’t survive sustained contact with normal matter. Past foes return and are defeated with the same things: Ice Warriors with heat, old school Cybermen with gold (new school ones, being from a different universe, do not have this weakness), Sontarans with the probic vent. What is perhaps best, old foes are NOT always foes; the Ice Warrior turns out to be a good guy in Curse of Peladon. So… yes, there’s technobabble, but at least they kept it surprisingly consistent for a long time. I loved Dr. Who as a kid and I still watch it from time to time now. In the very oldest series (with the first Doctor) they set up a cool plot about the inevitability of the future (where they were frozen in a museum for all time) and I was really looking forward to how they would escape this terrible fate. Unfortunately, the next episode just ignored the whole thing and pretended that it hadn’t happened which was probably the worst way of resolving it. Dr. Who is great despite, and sometimes because of, the wacky plots. The Architect from the Matrix isn’t a Deus Ex Machina, primarily because he takes no actions, does not influence the story and does not resolve anything. He is, in fact, a reveal and explains to Neo, and thereby the audience, what is happening. He reveals that Neo, far from having escaped the trap, is in a bigger trap. Neo doesn’t accept this and walks out the wrong door without the Architect stopping him and goes on to prove the Architect wrong. Yes the Architect built the Matrix but he has less power than any other character in the movies and seems quite grumpy at the end that the Oracle played him. If anything is a Deus Ex Machina it is the whole ‘balance the equation and all problems go away’ thing at the end, but even that was alluded to earlier. I’d start with Jon Pertwee (the 3rd Doctor). He’s sort of the bridge between Classic and Old Skool, & his transformation into Tom Baker aka everyone (else’s) favorite Doctor is my fave reincarnation scene ever. #5 & #6, regrettably, lacked something essential. Maybe it was just the 1980s. But Sylvester McCoy (#8) won my heart back. I first started watching _Dr. Who_ with the 9th Doctor, Christopher Eccleston. I think you basically said this, Fenzel, but DEM works in the “world” of the show because the point is that since the main character (the Companion, not the Doctor) doesn’t know what’s going on, a spoon-fed solution is the only thing that could possibly fix the problem. I find the self-sacrifice solutions the most annoying because that has nothing to do with knowledge or understanding- those are purely situational (usually- I’m sure there are exceptions), not informational. The technobabble episodes are easier to swallow because I’d be in the same situation as the Companion and would, as they do, take what is presented to me pretty much at face value once it has been shown in action. Further, there are indeed times where it’s alluded to and glossed over (“The Empty Child”/”The Doctor Dances”), and it is sometimes done better than others; but not always, and yeah, stuff (sometimes literally) drops out of the sky, but so does the Doctor himself into the life of his Companion each time she changes. 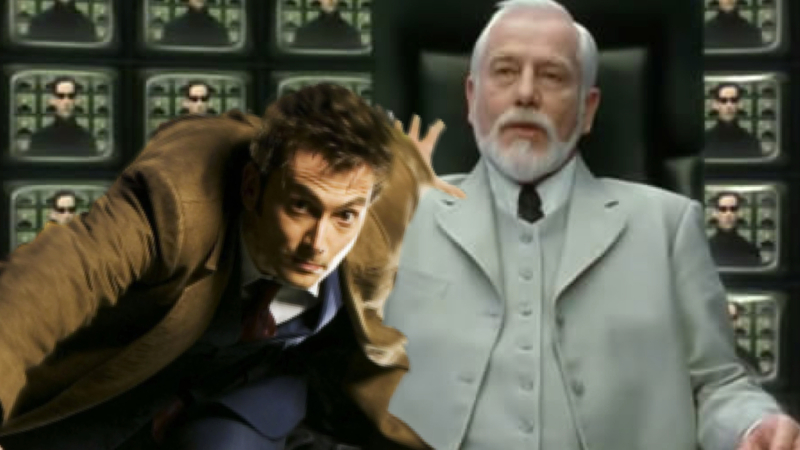 The foundation of the show depends on a sort of DEM, the Doctor himself intruding and usurping his Companion. About _The Matrix_: I haven’t seen the third one since it was in theaters, but I think that if The Architect had been played by The Oracle, wouldn’t that make HER the DEM? The Doctor is played by a British actor and has a British accent as such, but the character isn’t British, he’s a Time Lord, an alien race. So by that standard, the American equivalent doesn’t necessarily have to *be* American, right? They wouldn’t even need to be human. I have no idea who this could be, but I’m just throwing that monkey wrench in there to see if anyone else is more clever than I. 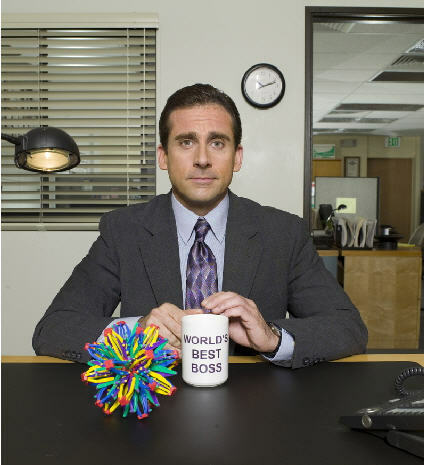 Although I do think pretty much anybody from Dunder Mifflin could, in some ways, work. Really, I think the “American” (if I could somehow double-capitalize, I would) chosen depends on what image is being emphasized. So sure, why not Homer Simpson? Also *does* the show/movie still need to be going? I mean, what about Tim Taylor from _Home Improvement_ or Tony Soprano from (duh) _The Sopranos_? Two very distinct characters, each portraying different aspects of “Americans” that we project into the global Popular Culture. What I would like to be overthought in the Whoverse is the use of the Jesus figure in the Doctor and how religion does (and doesn’t) play a part in the world of the Doctor. Unfortunately Farscape is no longer on the air or I would nominate John Cricton as the American incarnation of the Doctor. He has companions. (Though they are more like equals) usually is able to solve problems based on some weird aspect of his humanity (phycical, mental or spirtual) and his actions often result in the death of minor charcters (for those who point out that Paol Zahn ?sp? Was not minor I refer you to the poor fate of Adric, the young math genius who maybe was a lizard). I do admit that Farscape was not an American show, but Crichton was an American charcter. Similarly, Hugh Laurie isn’t American (please watch Jeeves and Wooster; and please skip a Bit of Fry and Laurie) but House is an American character so I humbly stand by my nomination. Also, if House is the Doctor he is definitely William Hartnell. This is confusing for me because Dr. Cuddy is totally Rose Tyler. I humbly submit that Wilson may, in fact, be House’s Romana. I will leave it at that. Sorry to revive a sleeping thread, but I just had a thought. Are Samantha Who? and Dr. Who? related? Please answer in a well-organized 5-paragraph essay. Audiences hate the Deus ex machina because of the ‘betrayal’. Its also possible to ‘judge’ these Deus ex machina in Dr Who on another level. Do the audience believe it more if its actually both ‘inevitable’ and ‘unexpected’? New to OTI and just found this article. I may have to sit down and do an analysis of my own, because, while I generally have a low tolerance for DEM endings, I haven’t felt too disappointed in the endings since the reboot. Sure, there are technobabble things involved, but the real answers are because of how the characters interact and investigate and connect with the best aspects of humanity. Take the Sontaran Strategem/Poison Sky two-parter. There’s a problem, but the true scope of it is not immediately apparent. Something’s weird, but it requires investigation to find out what’s really going on. Sure, there’s some technobabble involved in the final solution, but the real solution comes from the genius kid’s actions, not from the technobabble. 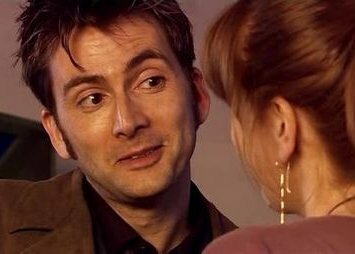 The Empty Child/Doctor Dance’s two-parter from Eccleston’s first season is similar–weird stuff’s going on, but only when the human element is put right, when Nancy and Jamie reconnect, can the Doctor solve the problem. Granted, maybe you considered the first episode I pointed out as one of the non-technobabble ones, but since you don’t have a list by episode (understandable because of spoilers), I’m not sure. Doctor Who usually has a really good handle on how to use technology. The sonic screwdriver will open locks and cut barbed wire and a lot of other things that get the characters further involved in the story, but it doesn’t just magically stop the aliens. And if it would provide a convenient escape, making it too easy, it doesn’t work.